First introduced in 1992 for modular 4.6 liter engines in the Crown Victoria, Grand Marquis, and Town Car models, these transmissions are excellent choices for street performance with small block engines. By 1994, these units had completely replaced the older AOD. They're readily available on the used market and are great for retrofitting into earlier vehicles. 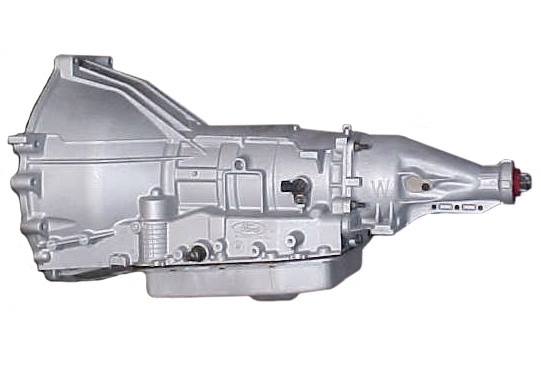 We recommend obtaining a 1998 or later transmission for your project because they contain most of the important updates and are best suited for performance applications. Compared to the AOD, they offer increased strength, greater reliability, and complete electronic control of all transmission functions. Often times, they are a better choice and more cost effective than upgrading an AOD. Only 7/8ths of an inch (22mm) of added length to the bell housing means that these transmissions will fit just about anywhere the older AODs did. The valve body is thicker, simpler, less likely to warp, and more reliable than that of the AOD. Other improvements include a 2 inch wide overdrive band, larger overdrive servo, stronger input shaft, and lockup converter clutch rather than mechanical, gear-dependent lockup. The torque converter clutch can be locked or unlocked in 2nd, 3rd, and 4th gear. This means you don't have to compromise between streetability and performance. Although unable to in its factory configuration, it is possible to modify the valve body to achieve converter clutch lockup in 1st gear. 4R70W (wide gear ratio) offers all of the above with lower 1st and 2nd gear to aid acceleration. A synchronous shift is one that requires either a clutch or a band to release before the next element engages to complete a shift. These can take longer to complete and be more difficult to tune. Non-synchronous shifts occur by simply applying the next element and do not require any components to release prior to engaging the next gear. Another advantage to using the AODE / 4R70W platform is the fact that they are non-synchronous during the 1-2 and 2-3 shifts. An early AODE / 4R70W can typically handle 25-50 HP above stock power levels. Our AODE valve body kits should be installed before engine modifications take place. 1998 and later 4R70Ws can handle up to 500 HP with our valve body kit. 2001 and later can handle 500hp with only our controller or modified engine computer. Higher power levels should consider having the transmission rebuilt with heavy duty components from a reputable transmission shop. 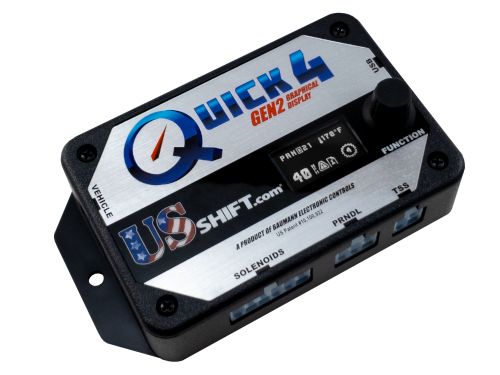 Click here to learn more about using the Quick 4 to control AOD-E and 4R70W transmissions.